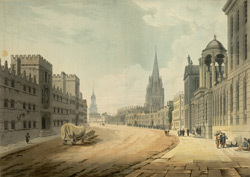 Artist: De la Motte, W.
View of the High Street in Oxford by W. de la Motte. The High Street is described by Pevsner in his ‘The Buildings of England’- the Volume on Oxfordshire. His description reads, “The High Street is one of the world’s greatest streets. It has everything. It is on a slight curve, so that vistas straight ahead always change. It has plenty of good and impressive buildings of large size, mostly of course colleges but also two churches, all this set off by just enough modest houses, and it has a few trees”.